Get Up to 25% off MSRP discount available to retail customers on the purchase/lease of all in-stock 2019 Ram 1500 Classic models at all participating dealers. Discounts are calculated based on MSRP plus options, freight, A/C and tire charge and will be deducted from the negotiated price before taxes. Percentage off MSRP discount cannot be combined with any other bonus cash or consumer cash offer. This offer cannot be combined with low rate financing. Dealer may sell for less. See dealer for complete details. Lease for Lease financing available through SCI Lease Corp. to qualified customers on applicable new 2018 models at participating dealers. SCI provides all credit approval, funding and leasing services. Dealer order/trade may be necessary. Example: 2019 Ram 1500 Big Horn with a Lease Price of $47,750 leased at 2.99% for 24 months with a $500 security deposit, $2,992 down payment and first month’s payment due at lease inception equals 104 weekly payments of $99 with a cost of borrowing of $2,427.75 and a total obligation of $13,348.25. Kilometre allowance of 18,000/year.Cost of $0.16 per excess kilometre plus applicable taxes at lease termination. See your dealer for complete details. Lease for Lease financing available through SCI Lease Corp. to qualified customers on applicable new 2018 models at participating dealers. SCI provides all credit approval, funding and leasing services. Dealer order/trade may be necessary. Example: 2019 Ram 1500 Big Horn with a Lease Price of $40,895 leased at 2.99% for 24 months with a $0 security deposit, $2,499 down payment and first month’s payment due at lease inception equals 104 weekly payments of $78.87 with a cost of borrowing of $2,103.08 and a total obligation of $10,761.73. Kilometre allowance of 18,000/year.Cost of $0.16 per excess kilometre plus applicable taxes at lease termination. See your dealer for complete details. Lease for Lease financing available through SCI Lease Corp. to qualified customers on applicable new 2018 models at participating dealers. SCI provides all credit approval, funding and leasing services. Dealer order/trade may be necessary. 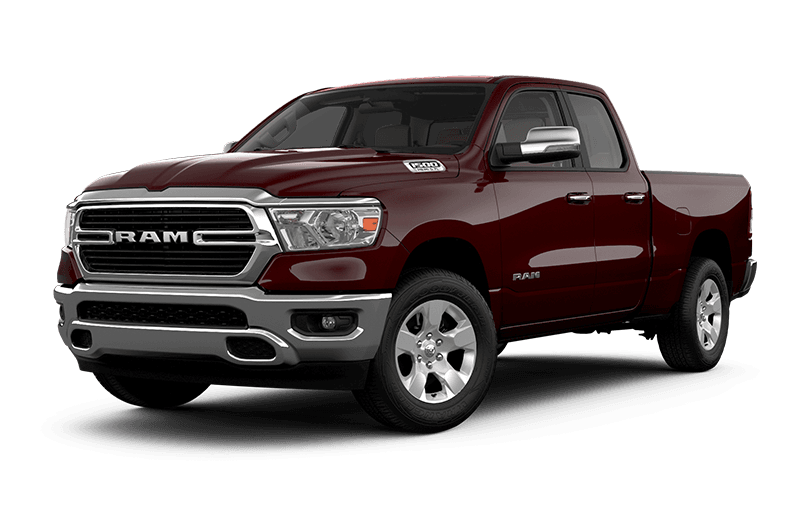 Example: 2019 Ram 1500 Big Horn with a Lease Price of $40,895 leased at 2.99% for 24 months with a $0 security deposit, $2,499 down payment and first month’s payment due at lease inception equals 104 weekly payments of $79.42 with a cost of borrowing of $2,101.28 and a total obligation of $10,818.93. Kilometre allowance of 18,000/year.Cost of $0.16 per excess kilometre plus applicable taxes at lease termination. See your dealer for complete details. The AISIN 3-year or 290,000-kilometre is a separate transmission limited warranty. See your Ram retailer for a copy of this limited warranty. Based on Automotive News full-size pickup segmentation. 2018 EnerGuide highway fuel consumption ratings. Government of Canada test methods used. Your actual fuel consumption will vary based on driving habits and other factors. 11.8 L/100 km (24 mpg) city and 8.6 L/100 km (33 mpg) highway on Ram 1500 4x2 models with 3.0L EcoDiesel V6 and 8-speed automatic. Longevity based on IHS Automotive: Polk Canadian Vehicles In Operation data as of July 1, 2016, for model years 1988-2016 for the entire Ram large pickup segment compared to all competitive large pickups that have been on the road since 1988. Based on longevity of the Ram light duty pickup segment compared to all competitive light duty pickups on the road since 1988. Longevity based on IHS Automotive: Polk Canadian. Based on 2500/250 and 3500/350 class pickups. Based on 2500/250 and 3500/350 class pickups. 370 horsepower on 3500 Mega Cab models. Based on 2500/250 class pickups. Based on IHS Markit Canadian Vehicles in Operations data as of July 1st, 2018 for all heavy duty diesel pickups with series 250/2500 and 350/3500 continuously sold since 1994 and have the highest overall average percentage still in operation. Durability based on longevity. Based on Canadian Vehicle Registration data 1994 - July 2018 for 250/2500 and 350/3500 heavy duty diesel pickups. Based on class 3-5 conventional chassis cabs. Based on class 3-5 conventional chassis cabs. 370 hp on 3500 Chassis Cab models over 10,000 lb GVWR; 366 hp on 4500/5500 Chassis Cab models. Based on the latest available competitive information for Cargo Vans marketed as Small Vans in the WardsAuto Small Van segment (Chevrolet City Express, Ford Transit Connect and Nissan NV200). Based on the latest available competitive information for Cargo Vans marketed as Small Vans in the WardsAuto Small Van segment (Chevrolet City Express, Ford Transit Connect and Nissan NV200) When properly equipped. Based on WardsAuto Large Van segmentation. Siri Eyes Free requires an iPhone equipped with Siri. Certain features not available while the vehicle is in motion. iPhone must be within active cellular range. Customer’s existing iPhone data rates apply to internet supported features. Oil change intervals will vary based on excessive engine run times, operating conditions, maintenance schedules, and driving habits. See your dealer for full details. Based on IHS Markit Automotive Canadian New Vehicle Total Registrations for combined years 2013 to CYTD August 2018. Based on IHSMarkit Automotive Canadian New Vehicle Total Registrations from CYE 2011 – 2015 and CYTD July 2016 for the FCA custom Large Pickup HD Segment which includes: RAM and Dodge 2500/3500 Series Pickup Trucks, Chevrolet and GMC 2500/3500 Series Pickup Trucks and Ford F250/F350 Pickup Trucks. Based on EnerGuide highway fuel consumption ratings. Government of Canada test methods used. Your actual fuel consumption will vary based on driving habits and other factors. 11.3 L/100 km (25 mpg) city and 8.0 L/100 km (35 mpg) highway on Ram 1500 Quad cab 4x2 HFE model with 3.0L EcoDiesel V6 and 8-speed automatic. 12.9 L/100 km (22 mpg) city and 9.3 L/100 km (30 mpg) highway on Ram 1500 Regular cab 4x2 HFE model with the 3.6L PentastarTM VVT V6 and 8-speed automatic. 2017MY EnerGuide fuel economy ratings not released. 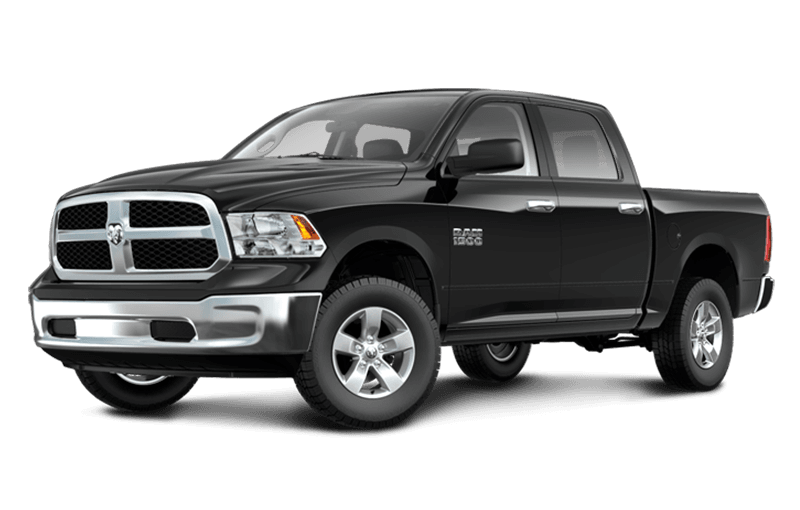 Ram 1500 3.0L EcoDiesel V6 fuel economy numbers based on 2016MY EnerGuide ratings. Driving range based on EnerGuide city fuel consumption ratings and fuel tank capacity. Your actual driving range will vary based on powertrain, driving habits and other factors. Use for comparison purposes only. More than eighty percent of Ram large pickups in each model year 2004 - 2017 are still on the road today, based on July 1, 2017 IHS Markit Canadian VIO registration data vs. Total New Registrations for the same vehicles. Based on IHS Markit Canadian Vehicles in Operation data as of July 1, 2018 for Light Duty Pickups Model Years 1990-2019 versus Total New Registrations of those same vehicles. Counts for RAM include both RAM and Dodge. Based on IHS Markit Canadian Vehicles in Operation data as of July 1, 2018 for Model Years 1990-2019 versus Total New Registrations of those same vehicles. Counts for RAM include both RAM and Dodge. Based on IHS Markit Canadian Vehicles in Operation data as of July 1, 2018 for the RAM Heavy Duty 2500/3500 Diesel Pickups Model Years 1994-2018 versus Total New Registrations of those same vehicles. Counts for RAM include both RAM and Dodge. Based on 2500/250 and 3500/350 class pickups. Oil change intervals will vary based on excessive engine run times, operating conditions, maintenance schedules, and driving habits. See your dealer for full details. Based on class 3-5 conventional chassis cabs. Oil change intervals will vary based on excessive engine run times, operating conditions, maintenance schedule and driving habits. Excluding diesel engines with B20 fuel. Based on 3500/350 class pickups. Based on latest available competitive information. Class based on Light Duty pickups. Based on Automotive News Full-size Pickup segmentation. Based on Ram 1500 Limited/Laramie Longhorn standard premium content comparison to Ford F-150 Platinum and Chevy Silverado 1500 High Country. Based on Automotive News Full-size Pickup segmentation. Excludes other vehicles designed and manufactured by FCA US LLC. Based on Automotive News Full-size Pickup segmentation. Based on Crew Cab model offerings. Available with 5.7L HEMI V8 only. Based on 2500/250 and 3500/350 class pickups. When properly equipped. Offer for Apple Music in Canada begins May 1, 2018 to April 30, 2019 with retail purchase/lease of qualifying new Chrysler, Dodge, Jeep, Ram and FIAT vehicles. New Apple Music subscribers get 6 months free. Existing Apple Music subscribers get 3 months free. Not for resale and no cash value. Requires iTunes account. See dealer for details. Apple is a registered trademark of Apple Inc.
25% off MSRP discount available to retail customers on the purchase/lease of all in-stock 2019 Ram 1500 Classic models. Discounts are calculated based on MSRP plus options, freight, A/C and tire charge and will be deducted from the negotiated price before taxes. Percentage off MSRP discount cannot be combined with any other bonus cash or consumer cash offer or with low rate financing. See dealer for complete details. 0% financing up to 60 months available on all 2018 RAM 1500 DS models on approved credit through RBC, Scotiabank and TD Auto Finance. Example: 2018 Ram 1500 with a $55,265 purchase price financed at 0% for 60 months equals 60 monthly payments of $921 with a $0 cost of borrowing and 3.32% APR. The APR is the effective interest rate which includes the Consumer Cash which 0% financing customers forego as a cost of borrowing. 0% financing cannot be combined with maximum Consumer Cash amount. See dealer for details. Total discounts of $4,500 available on all All-New 2019 Ram 1500 models financed at 0% and consist of $4,500 in Consumer Cash (deducted before taxes). See your dealer for complete details. 2.99% leasing up to 24 months available on most All-New 2019 Ram 1500 models (excluding Tradesman). Example: a 2019 Ram 1500 Quad Cab 4x4 Big Horn with a lease price of $38,338 (including Lease Cash of $8,500, Loyalty/Conquest Bonus Cash of $2,000 and a down payment of $2,499), leased for 24 months at 2.99% equals 104 weekly payments of $79. $2,499 down payment, $500 security deposit due at lease inception, with a cost of borrowing of $2,122, and total obligation of $10,662. Kilometre allowance of 18,000/year. Cost of $0.16 per excess kilometre plus applicable taxes at lease termination. See your dealer for complete details. 0% financing up to 48 months available on all All-New 2019 Ram 1500 models on approved credit through RBC, Scotiabank and TD Auto Finance. Example: An All-New 2019 Ram 1500 with a $61,090 purchase price financed at 0% for 48 months equals 48 monthly payments of $1,273 with a $0 cost of borrowing and 3.18% APR. The APR is the effective interest rate which includes the Consumer Cash which 0% financing customers forego as a cost of borrowing. 0% financing cannot be combined with maximum Consumer Cash amount. See dealer for details. Total discounts of $9,445 available on most 2018 Ram 2500 models (excluding Cab and Chassis and gas models) consisting of $9,445 in N/C Diesel Discounts (the MSRP of the No Charge Cummins Diesel engine) which are deducted before taxes. See your dealer for details. Total discounts of $9,445 available on most 2018 Ram 3500 models (excluding Cab and Chassis and gas models) consisting of $9,445 in N/C Diesel Discounts (the MSRP of the No Charge Cummins Diesel engine) which are deducted before taxes. See your dealer for details.